Week by week and game by game, the challenge gets bigger every week in the Class 6A state football playoffs. The Lake Oswego Lakers know that as well as anyone. The top-ranked Three Rivers League champion Lakers have already beaten 32nd-ranked North Medford 42-6 and No. 16 Oregon City 49-14, but the challenge gets bigger in this week's state quarterfinals. At 7 p.m. Friday, Lake Oswego hosts one of the state's marquee programs — No. 8 Central Catholic — to Cobb Field with a state semifinal berth on the line. The Rams enter the contest after winning five of their previous six games and carrying a 7-4 overall record after tying for second place in the Mt. Hood Conference. The Lakers, meanwhile, are winners of seven straight games and carry a 10-1 record. "It doesn't get any better than this," said Lake Oswego coach Steve Coury. "I've been telling the kids to embrace it and enjoy it." The Rams, who have notched playoff wins over No. 25 Lincoln 42-28 and No. 9 Tualatin 28-21 in overtime, are led by a quartet of first-team all-Mt. Hood Conference selections, including junior quarterback Cade Knighton (5-foot-11, 195 pounds), senior center Daniel Jefferies (6-0, 245), junior running back Elijah Elliott (5-11, 180) and junior wide receiver Silas Starr (6-3, 190). "They're very athletic. They've got great athletes at every position," Coury said. "Their running back (Elliott) has great speed — he can take it to the house any time." Central Catholic will also count on second-team all-MHC picks Lach Davidson (a 6-0, 185 senior kicker), Andrew Gross (a 6-1, 255 offensive lineman), Elliott at kick returner and Kalvin Souders (a 6-3, 180 junior wide receiver). On their side of the ball, the Lakers feature their own cornucopia of offensive weapons, led by the following all-Three Rivers League first teamers: senior quarterback Jackson Laurent (6-1, 200) — he's thrown for 2,453 yards and 27 touchdowns with just two interceptions while completing 64 percent of his throws; junior running back Casey Filkins (5-11, 185) — the TRL Offensive Player of the Year — he has piled up 886 yards and 20 TDs on 131 carries; junior wide receiver Thomas Dukart (6-1, 175) — he's made 37 catches for 728 yards and nine TDs; senior tackle Tanner Hall (6-1, 225); and senior guard Ryan Bertelson (6-3, 285). The Lakers' offense will also look to second-teamers Marshall McGuire (a 6-3, 220 junior tight end), Tiger Shanks (a 6-6, 330 junior tackle) and Mo Linver (a 5-11, 250 senior center). Both teams are stacked defensively, too, the Rams led by first-team all-MHC picks Miles Jackson (a 5-11, 190 junior defensive back), Joe Nizich (a 6-0, 195 junior linebacker), Travis West (a 5-6, 150 senior defensive back) and Braeden Veary (a 5-9, 180 junior lineman). Honored as a second-team selection for Central Catholic was Logan Nomura (a 6-2, 245 junior lineman). "They've played a lot of great teams outside their league and they're very physical," Coury said. 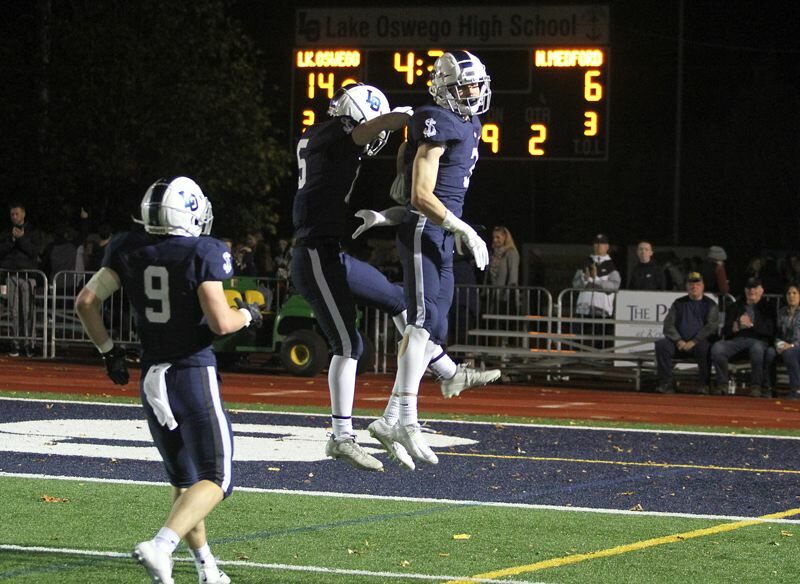 For Lake Oswego's defense, leaders include the following first-team all-TRL picks: senior linemen Mike Mercep (6-2, 220) — the TRL co-Defensive Lineman of the Year — and McGuire; senior linebackers Gabe DeVille (5-11, 195) and Keenan DeRaeve (5-10, 180); junior defensive back Joe Hutson (6-1, 160 and the team leader in interceptions with four); senior defensive back Matt Sebolsky (5-10, 165) and Dukart at safety; and second-team selection Bryson Breeze (a 5-11, 190 senior linebacker).